There’s been a bit of buzz lately from some less than reputable news sites reporting on what they consider a new, hip trend, surface anchors being installed on fingers in place of wedding rings. While Modblog readers and BME fans are certainly not going to be unfamiliar with the erroneous concept of piercing fingers and hands as we near an anniversary of Shannon’s own attempts at his hand web piercings, the body piercing industry as a majority has largely changed face on what we now refer to commonly as “long term temporary” piercings. I was approached by Refinery29 in order to comment on the subject, and after seeing the final article printed to seem almost positive towards the idea, I feel like the whole story should be told. (And, you know, I already wrote the whole thing). R29: I know pain threshold is a very subjective experience, but on a scale of 1-10, how much would a micro-dermal piercing like this hurt? TV: When it comes to microdermals – or surface anchors as we more commonly refer to them these days – the sensation for the client receiving the piercing is a bit unlike a traditional piercing. The way I describe the feeling to my clients is to explain that they will feel a piercing-like pinch while the initial pocket is made with a needle, and then more of a pushing-like pressure as the jewelry is inserted. Pain levels will of course vary from person to person, though surface anchors are usually on the lower end of the pain scale for most of my clients – even those without much or any prior experience in being pierced. Fingers may tend to be a bit more sensitive. RT: What would the recovery and healing process be like? TV: Recovery time with most piercings is very minimal. The first few hours to first week or so will contain some light soreness, swelling, mild redness and minimal bleeding around the piercing site as the body’s inflammatory system activates and begins the first stages of the healing process. From there, things will calm down and relax steadily throughout the rest of the healing period. According to the Association of Professional Piercers, Surface Anchors tend to take between 3-4 months to fully heal. During that time and as the body begins healing the damaged tissue, the piercing will begin to discharge a light amount of what we commonly refer to as fluid that will become “crusties” – or medically, serous exudate. This discharge is a very normal part of the healing process of any piercing at all and appears as a mostly clear, thin, watery plasma that will dry around the piercing site and form light scabbing. It should be gently removed with a very minimal aftercare regimen during healing. RT: Is it normal for a piercing to continue to bleed like in most of those photos? TV: While any piercing may bleed a bit immediately during the piercing itself or for a very short while afterwards, extended bleeding is not something we see often with microdermals at all. In very simple terms, in body piercing we are essentially making a hole through the body and then immediately “plugging” it. 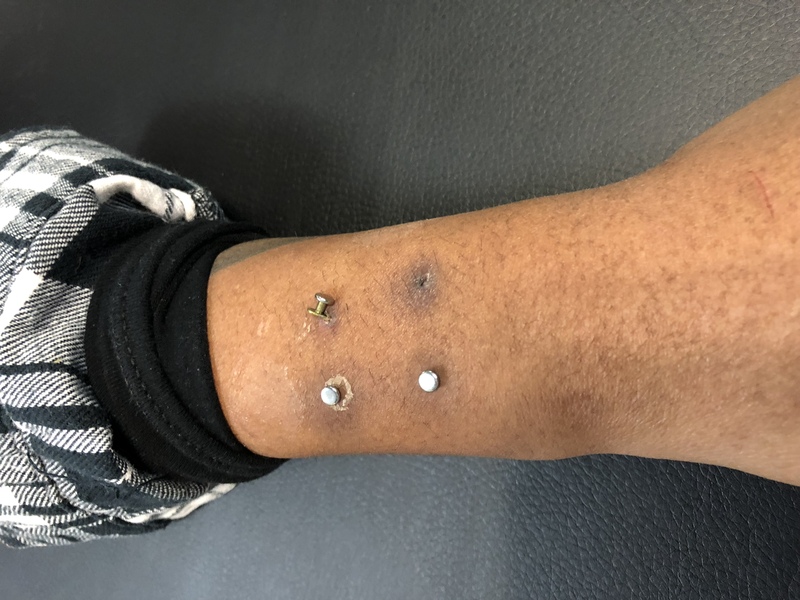 In many occasions, microdermal piercings will be completed by placing a band-aid over the piercing site itself, though this is usually less to prevent any bleeding and more to prevent any accidental catching or snagging that may affect the piercing after being freshly done. RT: How close are these finger piercings/anchors to the bone? TV: Not at all! A microdermal piercing when properly placed will sit in the dermis, the layer of tissue directly beneath the outer surface layer of the skin – the epidermis. They are routinely placed less than a 1/4” beneath the outer surface of the skin, and on places such as fingers – often only about half that. RT: How do the anchors of a dermal piercing work differently than another? TV: Surface anchors are unique from other piercings in that they are a single-point piercing, meaning that they have only one point of entrance and exit for the entire piece of jewelry. Onlookers will often ask with curiosity (or sometimes pure bewilderment): “Does that go all the way through?!”. Instead of a piercing completely made through an ear, or a fold of tissue in say a navel, microdermal piercings are performed by creating a pocket within the top two layers of skin and placing the jewelry snugly and securely within the dermis. RT: What are possible side effects for a piercing like this? TV: The biggest and most important side effect to note is that microdermals have a limited lifespan. In my professional experience, clients tend to average around 2-6 years with the piercings before issues arise or they chose to take them out for other reasons – such as lifestyle changes, job requirements, or a change of aesthetic. I have seen surface anchors last upwards of 10+ years and also ones that have to be removed after less than 6 months. The common term among professionals used to describe the longevity of a microdermal is “Long-term temporary”. When the first modern microdermals were introduced widely in 2006 by Pat Pruitt of Custom Steel, they were referred to as “Borderline Permanent” as their longevity had yet to be tested. Earlier prototypes showed mixed results but most resulted in inevitable failure. Secondary to rejection, the largest risk factor when it comes to any piercing on the hands is infection. Think about all of the things your hands touch on a regular basis, and now imagine all of those getting in an open wound over 4 months! If we take a look at simple medical studies on wound healing, lacerations on the hand tend to have almost double the infection rate versus those on other parts of the body. While infection rates across the board are already pretty low, especially in the case of traditional piercings, we certainly do not want to encourage higher risk placements and increase those possibilities. Lastly, scaring. As scaring will differ from person to person, it is very difficult for us as professionals to estimate how the piercing site may scar once it has been removed down the line. Some people are left with lightly noticeable scaring, some people may be more prone to keloid-type scars, and some may be simply left with just a subtle little dimple as you’ll see below. RT: What does the rejection of a piercing actually look like? What should someone look out for? Surface anchors in different stages of rejection or removal. In microdermals, early issues with the piercing can be identified by a notable amount of swelling, irritation, excessive redness or soreness, and the jewelry no longer remaining “flat” against the surface of the skin. At this stage, I would recommend returning to your piercer to have them see if the problems may be able to be resolved on their own before furthering. In the later stages, rejection may appear as the jewelry having tilted to one side or another, irritated tissue building up along the base of the jewelry, or entirely with parts of it protruding from the skin as pictured. By this point, it is a better idea to have the piercing removed by a professional rather than continue to let it work its way out on its own. RT: Would you recommend clients getting this kind of piercing? Do a lot request it? TV: Despite a few recent articles, requests for microdermal and surface anchor piercings have actually drastically decreased in recent years as more and more clients and more and more professional piercers are becoming aware of their impermanence, high likelihood of rejection and migration, and potential scarring after the piercing has been removed. I find that the majority of people getting such piercings these days, especially on outer extremities such as wrists, hands, and fingers are those who were not offered a proper explanation of what to expect during healing or after removal. These days, I remove far more microdermals than I insert. When it comes to extremities, such as hands, fingers, toes and the like, I do not recommend having them done – and nor do the vast majority of my colleagues. These areas are drastically more prone to infection, irritation, accidental catching, snagging, and almost all potential negatives that could happen to a piercing. Even the simple act of placing a hand into a pocket or down a sleeve when putting on a T-Shirt can turn into a complete ordeal as the piercing snags on clothing. Their longevity is dramatically reduced, and though you may see an increase or a large amount of photos of them being done – they are nearly always photos taken when the piercings were still brand new. RT: Where might there be a better placement on the hand? TV: Truthfully, there is not really a “better” placement for any piercing on a hand. Over the few decades, some of the best professional body piercers in the world experimented with a myriad of placements for piercings located on the hands and fingers. In short, they nearly all failed with the exception of some very small and unique cases of sheer luck. In summary, if you understand the risks, the likelihood that they will not be permanent adornments, and are okay with potential scarring once they have been removed – they can be a very fun, temporary addition to many different parts of the body. It is important to consult with a reputable piercer with much experience in this area beforehand who can explain all of these factors to you along with providing you a safe recommendation on placement options that will provide as much longevity as possible. Outliers will however always be a factor. Finger microdermals may potentially last a decade under the right circumstances and with enough luck – and many readers may know people who have successful microdermal piercings for extended amounts of time that may make them believe the success rate is much higher – but it’s important to remember that not everyone who jumps off of the Golden Gate bridge dies. And that my friends, is why pop culture should just continue to report on pop culture. This entry was posted in Editorial, ModBlog and tagged Microdermals, Newsfeed by Tobias. Bookmark the permalink. Angers me how people are getting microdermals instead of a wedding ring. You get married for love, not for a trend.